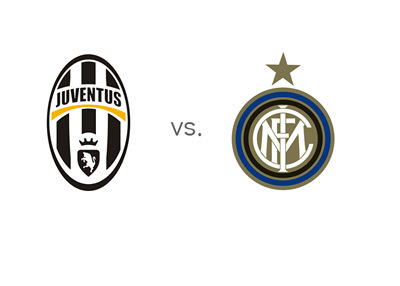 First place Juventus will host fifth place Inter in the twenty second round of the Italian Serie A on Sunday, February 2nd, 2014 at the Juventus Stadium in Turin. In Italy, a match between these two fierce rivals is called 'Derby d'Italia'. After losing in the Italian Cup to AS Roma, Juventus were held to a drew vs. Lazio in the league. Their advantage at the top of the tables has been reduced to six points, and now Juve will have to turn it on again to try and keep distance. On Sunday, they will be without Gigi Buffon, who is out due to a suspension. The 37 year old, Marco Storari, will take his place in goal. Inter are fighting for Europa League football next season. They are eleven points behind third place Napoli and only one point ahead of eighth place Hallas Verona going into Sunday's match. Inter have had a pretty bad start to the new year with losses to Lazio, Udinese (Cup) and Genora, and draws vs. Chievo Verona and Catania. Inter have scored only one goal in the last five matches and are still looking for their first win in 2014. What are the chances of Inter surprising the reigning champions? Probably pretty small as Juventus have won their last ten Serie A home games. A €100 bet on Juve could return €40 in profit, while the same bet on Inter could return €650 in profit. The most likely outcomes on Sunday, according to the odds, are 1-0 and 2-0 victories for the hosts, both valued at 6/1. Carlos Tevez is the favourite to score at 11/10, followed by Fernando Llorente at 5/4 and Fabio Quagliarella at 7/5. The Colombian striker, Fredy Guain, is the favourite to score for Inter at 21/10. Esteban Cambiasso, who has started every league game so far for Inter, is out with an injury. Maybe the newly signed Daniel Osvaldo will see a minute or two of playing time for Juve? This should be a pretty good game. Three valuable points are on the line.